The B-side of this single contains a beautiful cover version of Freddie Mercury's 'Love kills'. The single reached number 6 in the UK singles chart and number 5 in Ireland. Every now and again, I discover a new artist that has actually been around for a little while but I just managed to miss it. It doesn't matter because usually I'm there early enough to still collect all the relevant singles. 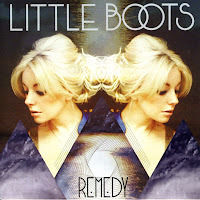 Little boots is my latest discovery, recording so-called electropop music that incorporates a lot of influences from the Eighties into a more modern sound. 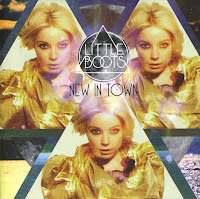 'New in town' is Little boots' debut single, released in May this year. Victoria Christina Hesketh, who uses Little boots as her stage name, wrote the song herself together with Greg Kurstin. According to her, the song is about 'being a stranger in a strange place which is fun but also has a dark side, and someone showing you around and in the end just kind of letting go'. The single reached number 13 in the UK singles chart.